One of the most persistent myths about young clergy is that if a church hires (or a Bishop sends) a young pastor, young people and their families will instantly flock to the church. This is a serious fallacy. While a young pastor *could* be especially insightful in reaching young adults for Christ, discipling them, and building relationships with them, it won’t matter a hill of beans if the church itself is not invested in doing the same. If you have never asked a Christian young adult what they think about the world or what they are looking for (if at all!) in a faith community, you need to rethink if you really want young adults in your church. Reality: A young pastor can help, but it takes a congregation dedicated to knowing, investing in, and serving with young adults to reach young adults. If you are praying for a young pastor to come so that she or he can do all the work of reaching young people, you are setting up that pastor to fail. You want a magic wand, not a pastor. We live in a society where different generations don’t interact with regularity. The breakdown of the family means that we might not know the generations before or after us. Where ancient cultures valued the wisdom of age, our marketing-driven economy only wants the self-indulgent wallets of the 20-40 crowd. Many churches are convinced that young clergy don’t care about or aren’t interested in ministry with older adults. Reality: This is a deep lie. Most of my young clergy colleagues value not only older clergy, from whom we have much to learn, but also the older adults we are blessed and called to serve. Stubbornness and close-mindedness are not limited to any age, and neither are joy or spiritual maturity. Many of my young clergy friends who staff larger churches are often pigeonholed as the youth and/or children’s minister. While many young pastors serve very effectively in these roles, one’s age does not necessarily correspond to giftedness with various generational ministries. Just because a young pastor has three young children, it does not follow that she or he wants to work with children day-in and day-out. Just because a young clergy likes the same bands that the youth do, doesn’t mean that the new young pastor is a good fit for the youth program. Reality: Young clergy all have different gifts, skills, and interests. Some might be great at planning contemporary worship, and others might love traditional liturgy. Some may love doing the children’s moment and others might hate it. You will meet young pastors who love visitation and pastoral care, and others who loathe it. There are young pastors passionate about administration, and others who are allergic to meetings. Don’t assume a young pastor has a specific set of skills or interests. Ask where they are gifted, be upfront about expectations, and be realistic about desired results. I used to think my job was hard, and then I got married. My wife is a physician, and I’ve been blessed to be her partner through MCATs, interviews, medical school, match day, and (most of) residency. United Methodist clergy go through a period of formation called “residency” before we are ordained, but trust me, it’s nothing like medical residency. I am constantly in awe of what my wife and her colleagues do: not just the technical mastery needed, not just the massive amounts of knowledge one is expected to hold or the crazy hours doctors work – but the fact lives are in their hands day in and day out, and at risk in decisions great and small. I contend that one could replace “medicine” with “ministry” in the above, and the description would still ring true. As a friend of mine says, the work of a pastor or priest is full of both “blessings and bedevilments,” which is of course true for most, if not all, vocations. My wife has given me newfound appreciation for medicine. 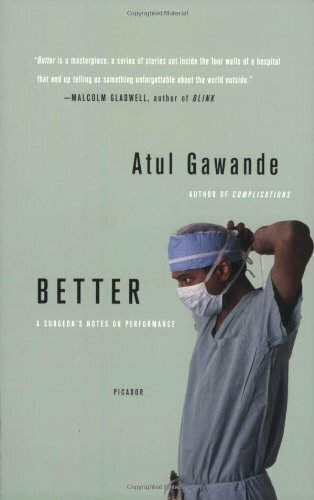 Gawande has helped me see some fascinating connections between my wife’s calling and my own. What other connections do you see? Have I overstated my case? I’d love to hear your thoughts below. Thanks to the team over at The United Methodist Reporter for the chance to offer some thoughts on vows, based in part on a recent piece that argued personal convictions trump ordination promises. If you haven’t seen it yet, the link is here. My guess is that this won’t actually bother Rightmyer all that much, since he will likely be enjoying the friendly embrace of ECO’s schismatic arms soon. 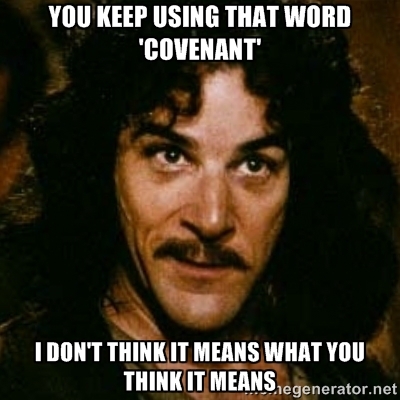 If it does, so much the better: there should be consequences for violating one’s covenant. It’s even more troubling to me that Rightmyer led this effort in his capacity as an interim. Funny enough, when you look on Highland Park’s website under “Our Denomination,” one of the things for which they praise ECO is a commitment to covenant: “To connect leaders in accountable relationships and encourage collaboration.” I don’t they know what that word “covenant” means. This is, after all, a new denomination built on stealing congregations from the PCUSA. This story caused a bit of a stir among some United Methodists. I find it encouraging, actually. 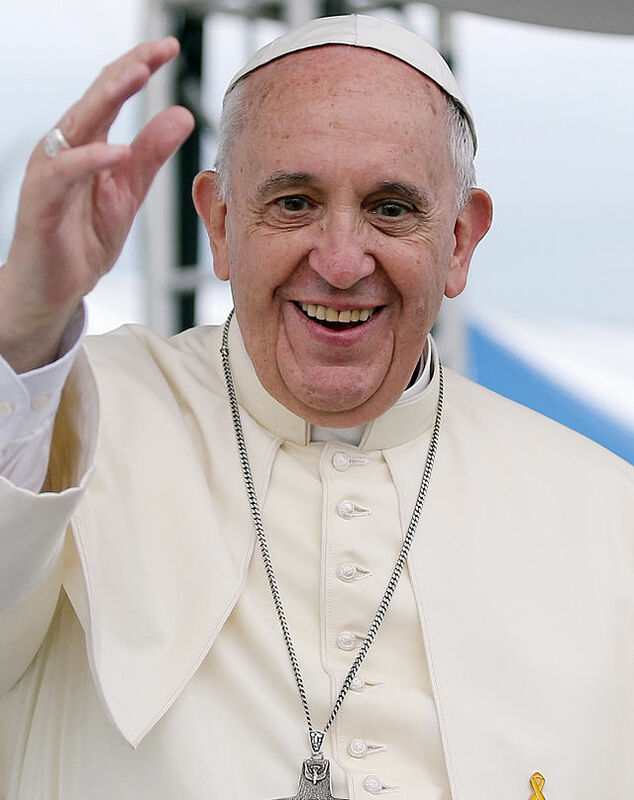 Yes, schismatics – people who tear the fabric of our fellowship – should be defrocked. This is as much a no-brainer as there can exist in the church. Many UMs seem to have little stomach for something that is rather common in other professions (and yes, I know that clergy represent neither a business nor a “regular” profession). One regularly hears of lawyers being disbarred or doctors losing their license for malpractice of some sort or another. Some state medical boards even publicly list those whose licenses have been revoked or are facing disciplinary action. When one’s vocation can seriously impact the lives of others for good or for ill, a lack of faithfulness to that vocation should lead to consequences. We either care about the church or we don’t; refusing to hold schismatics, abusers, and incompetents accountable is not grace, it is spiritually sanctioned indifference. It’s one thing for a pastor to find themselves at odds with the denomination that ordained them; it’s quite another to lead an exodus of clergy and/or churches from that denomination. The former is unfortunate, the latter is unconscionable. 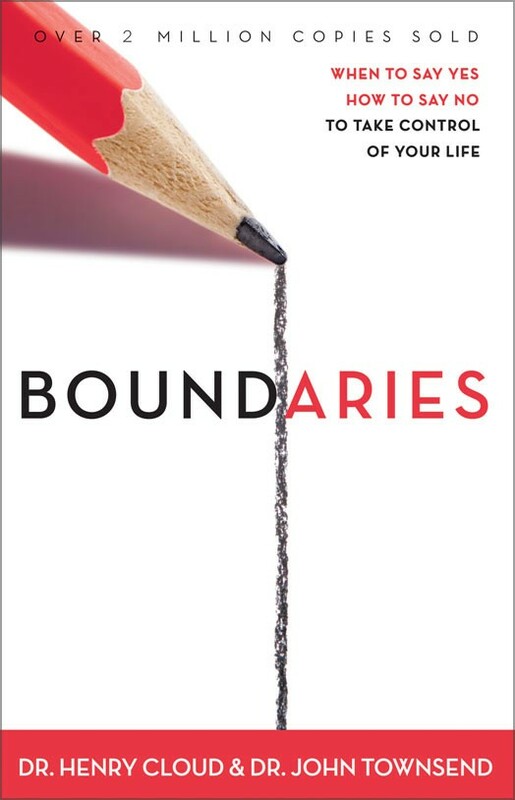 Every healthy organism has boundaries; like a cell, a healthy boundary is permeable – it’s not a wall, but it does have substance. The UMC needs some of the intestinal fortitude shown by the PCUSA to maintain some semblance of boundaries, otherwise the organism can only grow more sick. And remember, friends, there are schismatics on the left and the right. 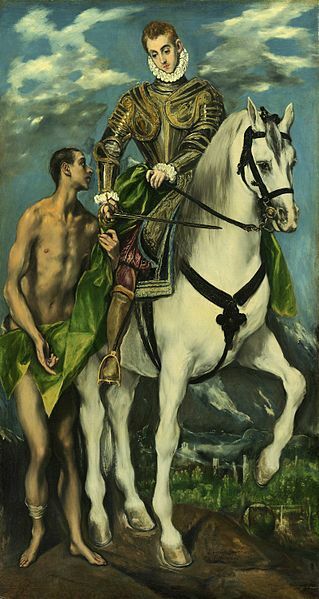 St. Martin and the Beggar, by El Greco. Courtesy Wikimedia Commons. Cappellani [chaplains] originally came from the cappa [cloak] of blessed Martin; the Frankish kings commonly took it with them in battle because it helped them to victory; because they carried it and cared for it with other saints’ relics, clerics began to be called chaplains. This means that chaplaincy has a decidedly military origin: both in St. Martin, himself a former soldier turned Bishop, and in the use of his half-cloak, venerated as a relic by medieval kings. 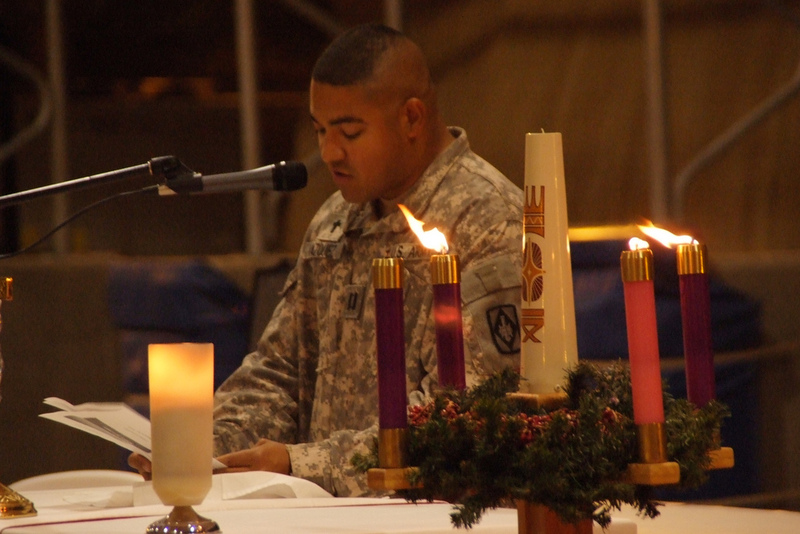 Today, chaplains in many contexts still care in the name of Christ at the service of soldiers, doctors, prisons, and ultimately, the church. Source: Andrew Totten, “Moral Soldiering and Soldiers’ Morale,” in Military Chaplaincy in Contention (Surrey: Ashgate, 2013), 22. 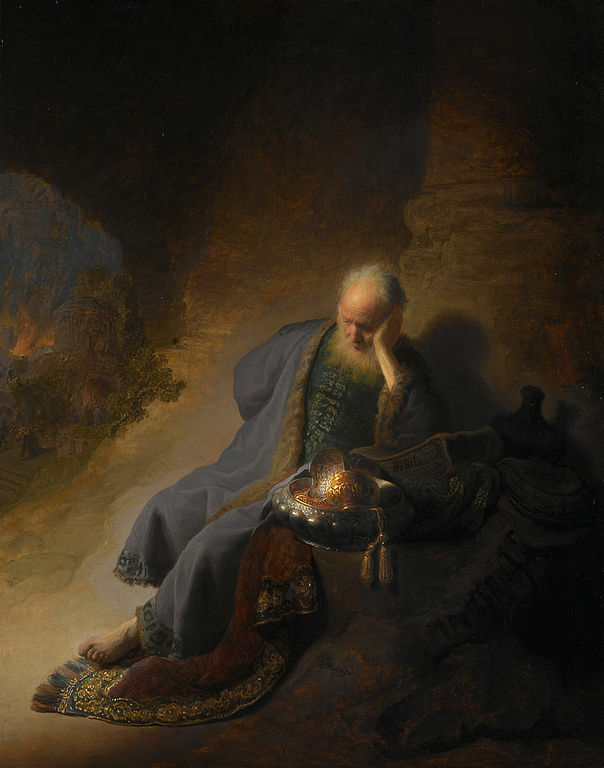 Jeremiah lamenting the destruction of Jerusalem, by Rembrandt. Courtesy Wikimedia commons. There are few roles in Scripture as misunderstood as that of the prophet. In conservative circles, “prophecy” is shrunken down to telling the future, usually by studying arcane tables and charts relating Daniel and Revelation to try and figure out when “the end” is coming. These people are usually tying to sell you something. In progressive Christian circles, being “prophetic” is essentially a baptized form of activism. Both of these miss the mark substantially. As we will see, this definition precludes both of the popular distortions of the prophetic vocation in the church today. Note the definition above. The primary content of prophetic utterance was interpretation of the here and now. The future may be involved, but it is to render change in the present. As Abraham Heschel puts it, “The prominent theme is exhortation, not mere prediction…his essential task is to declare the word of God to the here and now.” (14-15) Thus, fundamentalist and/or dispensationalist obsessions with prophecy as Biblical keys to the future or present are sorely missing the mark, no matter how many Mayan calendars or blood moons are there for the taking. Moreover, the problem with identifying prophetic work with any kind of activism or truth-telling (whether in church or society) is that it cuts both ways on the ideological spectrum. If one talks to enough folks on the left and the right – and this is especially true the UMC at present – you learn that both sides feel like besieged, risk-taking prophets standing up to a stiff-necked church. Both sides, to use a hackneyed phrase, believe they are “speaking truth the power.” Heschel was certainly right when he notes, “God is raging in the prophet’s voice.” (6) But what if the prophets are self-selected? Therein lies the perennial danger: we too quickly assume our own fury for that of the Divine. In his wonderful little book In the Name of Jesus, Henri Nouwen names temptations common to leadership and offers particular disciplines as solutions. He concludes this brief treatise by discussing the temptation “to be powerful.” In different ways, both the right-wing and left-wing perversions of the prophetic are temptations to power. Fundamentalists manipulate Scripture to show forth their own insight and giftedness, unlocking “secrets” of the end times heretofore unknown. In so doing they often amass large followings (and bank accounts). Progressives too quickly make use of the prophetic role to mask their own ideological agendas with a veneer of Biblical authority, and claim God’s voice for whatever the cause happens to be that week. In other words, what we consider “prophetic” may in reality unleash something more horrific than that which we speak out against. Or, on the other hand, our obsession with seeing the future may blind us to the needs of the present. We are all still afflicted by the fall, and this side of the eschaton we must be wary of confusing our mouth with the mouth of God, or to conflating our will with the will of Christ. A steady discipline of theological reflection, done with and through the church and her teachers – and including those with whom we disagree – is the only way that the prophetic task can escape the hubris of either future-casting or banal activism. The prophetic task (as noted at the top) of interpreting events and phenomena from a Divine perspective is an awesome and humbling vocation, and one that none of us should assume too quickly nor hold lightly. P.S. My apologies to those who had trouble viewing this before. I had severe problems with WordPress continuing to revert it to a draft after publishing. I think I have fixed it now. Thanks for your patience. Coogan, Michael D. The Old Testament: A Historical and Literary Introduction to the Hebrew Scriptures (New York: Oxford University Press 2006). Newbigin, Lesslie. Signs Amid the Rubble: The Purposes of God in Human History (Grand Rapids: Eerdman’s 2003). Nouwen, Henri. In the Name of Jesus: Reflections on Christian Leadership (New York: Crossroads 1989). 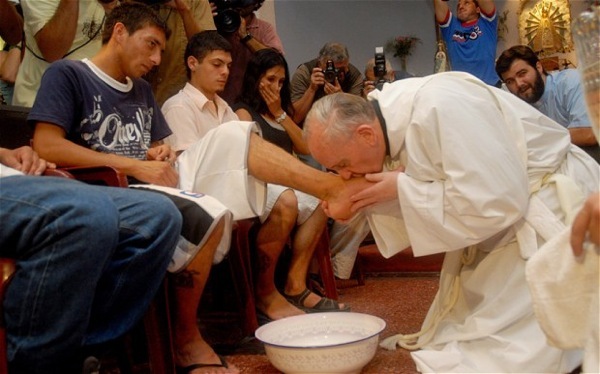 Acting like Jesus is often highly irrelevant, and yet beautiful, like Pope Francis washing feet. To put it another way: church leaders would do best to begin any task, goal, discussion, study, or discernment not by asking “what works?” or “what must we do?” but rather by seeking the face of God. 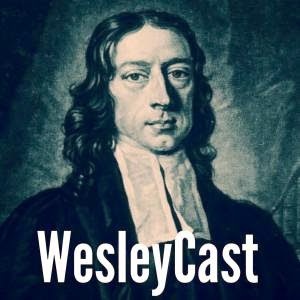 Amazing things happen when we refuse the temptation to relevance, and instead act, not out of calculated strategies and therapeutic utilitarianism, but out of an encounter with the living God of Scripture and the Church. To my clergy colleagues: do you have an adequate support system? To those in the church who care for their pastoral leaders: are you doing all you can to encourage and resource your pastors for their own spiritual, physical, and emotional well-being? Never forget: the most dangerous pastor in the world is the lone ranger. We can’t do this alone: we need God, we need each other, we need friends and loved ones. 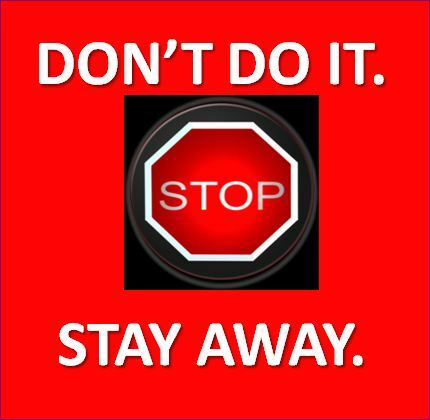 An isolated ministry is a dangerous ministry, for everyone involved. As go the leaders, so go the church. Healthy institutions require healthy leadership at all levels. Rediger’s wisdom is a good reminder of this. How often do we send this message to people discerning a call to ministry? “Do not enter the ministry if you can help it,” was the deeply sage advice of a divine to one who sought his judgment. If any student in this room could be content to be a newspaper editor, or a grocer, or a farmer, or a doctor, or a lawyer, or a senator, or a king, in the name of heaven and earth let him go his way; he is not the man in whom dwells the Spirit of God in its fulness, for a man so filled with God would utterly weary of any pursuit by that for which his inmost soul pants. 1. This advice assumes that ministry requires only one skill or ability. 2. This also implies that ministry is uniquely difficult. First, the “do anything else” advisers seem to want to drive away anyone from the pulpit that has any real skills! Of course an authentic calling – both internal and external – is greatly important. But calling does not imply a dearth of talents. There is no one “ministry gene” that someone needs to faithfully heed the call to church leadership. Instead, ministry requires a group of diverse skills, which will vary depending on the context. In my own setting – pastoring a small church – a normal week could requires skills in writing, oratory, management, long-range planning, counseling, caregiving, conflict resolution, research, coaching, and staff development. Even more specific ministry roles (for instance, youth ministry or executive pastor positions) will require a wide range of personal and professional skills. Does anyone possess them all? No, that’s why we focus on our strengths and manage our weaknesses. But all this goes to show that someone who will excel in ministry could likely succeed in a wide variety of fields related to leadership, communication, education, etc. To say to someone discerning a call to ministry that they should only go through with it if that cannot possibly do anything else is to drive away a great deal of talent and promise from the church. On the whole (with exceptions) the hours are long, the people are a problem (indeed without the interaction with people the Pastorate world be great!) and the pay is poor. I am not even sure about the retirement benefits. As one of my mentors taught me to recognize, “everyone works hard.” Especially in today’s economy, there is no work that is not difficult, that does not have unreasonable expectations, long hours, and little reward. Every company – for-profit or not – is attempting to get more out of its employees while paying less. No one makes what they are worth, with very few exceptions. Pastors would do well to remember that our people are in the same boat we are, and often (here I’m thinking of ordained UMC elders) we have more job security than they do. Our work is not uniquely hard. It would be more accurate to say our work is hard uniquely. In other words, ministry is not hard the way that a factory or office job might be, but is difficult because of the various skills needed (enumerated above) and the emotional toll that the week-in, week-out grind of church life can take – especially when funerals, sickness, conflict, and other emotionally draining parts of our vocation begin to pile up.